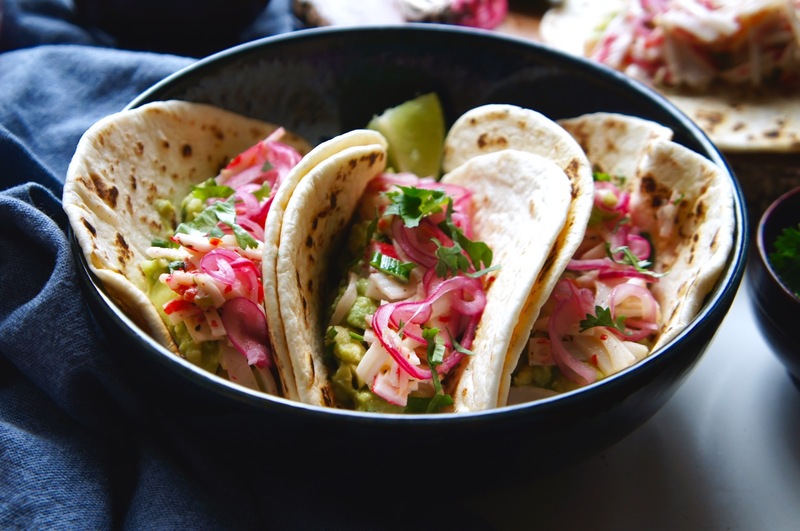 It was thanks to Breddos Tacos in London that I first discovered what it really means to eat a taco; how using such a simple combination of very well put together ingredients you can create an unforgettable, mini taste explosion. Now, i’m not claiming to have a recipe anywhere near the likes of theirs (especially the use of not-your-average-pig parts and ingredients from all corners), but what I have here covers a few important everyday supper requirements: easy, quick, cheap, delicious and healthy (but tastes indulgent). That last one was an important one, I wanted a recipe that feels indulgent but is actually healthy, and I think this one has hit the nail on the head – a handful of fresh ingredients put together in a few minutes. Perfection. If you’re not familiar with crab sticks (I use the most well known brand, Surimi), you have probably come across them in sushi form as the ‘fish’ part of the California roll. They are, apart from a little odd to be honest, pink fish sticks made from pulverised, lean white fish made to look like crab meat – also known as seafood sticks. 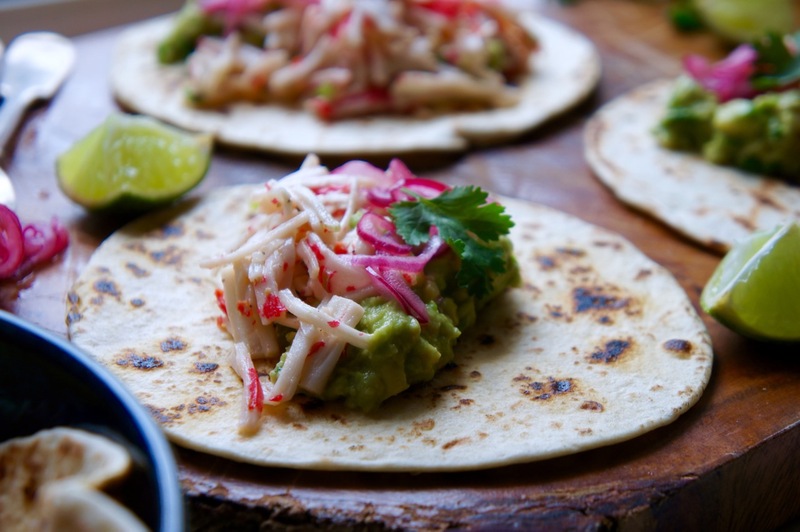 They are inexpensive, tasty and make a lovely addition to your taco if you don’t fancy spending quadruple the amount on a pot of fresh crab. If, however, you have the money or you live by the sea and have unlimited access to fresh crab (be my friend?) – crab would be a lovely alternative. 1. 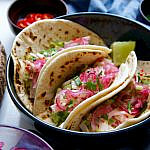 Put the sliced red onion in a small bowl with the juice of one lime, 1 tsp vinegar, the salt and the sugar. Toss it all together then leave it to soften and pickle whilst you prepare the rest of the ingredients. 2. In a medium sized bowl, mix the flaked crab sticks with the sliced spring onions and half the chilli. Toss it all together then mix in the mayo until all combined. Season with black pepper. 3. Scoop out the avocado and chop it into cubes. Mash the avocado with the juice of one lime, the crushed garlic clove and some salt and pepper – you can leave it chunky or mash it until it’s smooth. Stir in most of the chopped coriander and the other half of the chilli. 4. When all the other ingredients are ready, toast the tortillas in your frying pan (or grill pan) until lightly charred. 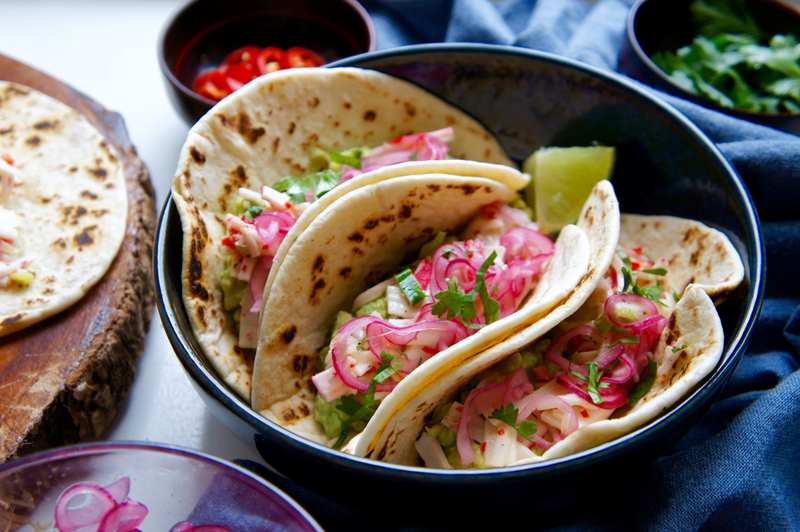 Bring everything to the table and let people make their own tortillas. 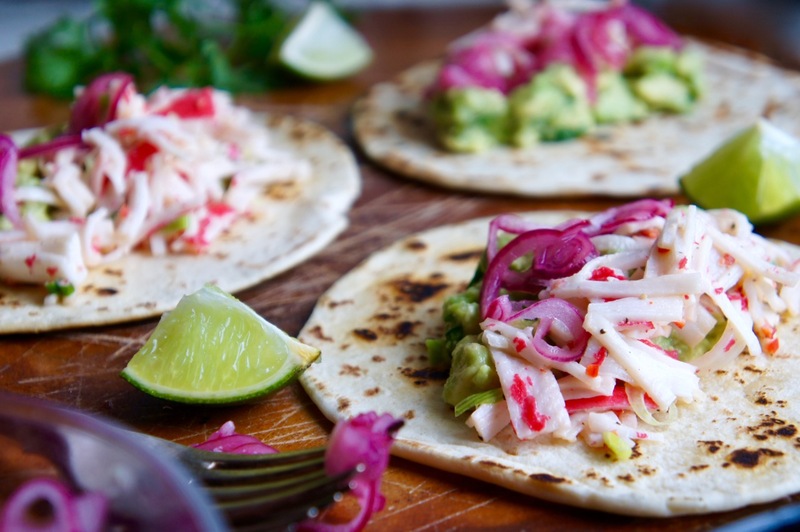 Top each tortilla with a little of the avocado mix, the crab sticks, the pickled onion and the remaining chopped coriander.